The Dordogne has fascinated travellers for a long time. A rural life lived at a relaxed pace, rich food, fine wines and picturesque villages set amidst stunning geographical features makes the region very attractive in the eyes of many. Cycling in Dordogne lets you immerse yourself in the picture perfect idea of rural France, exploring the regions from Souillac to Rocamadour. The Dordogne is one of Europe's most beautiful valleys home to rolling hills, thick orchards of apple and walnut, limestone cliffs and some of France's finest prehistoric cave art. Explore this fascinating region by bike. France’s Dordogne region is one of Europe’s most beautiful valleys and where you will find many great examples of pre-historic cave art and dwellings. 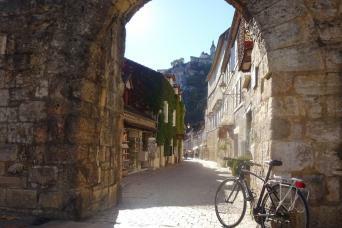 Cycle through distinctive limestone villages and the undulating countryside, whilst pausing to visit UNESCO World Heritage Sites, such as the incredibly vibrant cave paintings of Font de Gaume. 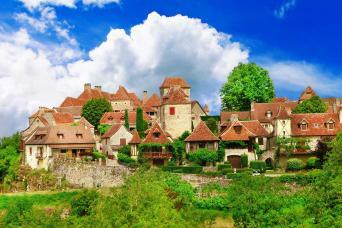 Discover the Dordogne’s geological wonders, medieval settlements and world famous gastronomy as you pedal from Souillac to Rocamadour.